In response to recent media lists that took an executive-led view on the movers and shakers in the media and journalism industries, Journalism.co.uk decided to compile its own list of digital media innovators and pioneers – the j-list. As with all lists, it’s incredibly subjective and open to debate. To provoke discussion further we asked for nominations for the 50th member of the j-list and opened the selection process up with a poll. 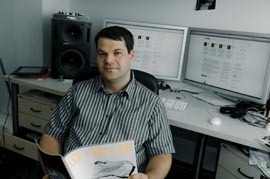 Tomáš Bella was longtime editor-in-chief and deputy director of Sme.sk, the most popular news site in Slovak republic. He was the author of projects such as the first European newspaper-owned blogportal (blog.sme.sk, 2004) and the first digg-like service (vybrali.sme.sk, 2006) that put the links to the competitors’ articles directly on the frontpage of major newspaper web. In April 2010 he co-founded Prague-based new media consulting company NextBig.cz and is working on a payment system that will allow the access to all the premium content of major newspapers and TV stations with one payment – it will be launched in Central Europe in January 2011. Tomáš, who received 15.78 per cent of the vote, was surprised and delighted to make the list, he told Journalism.co.uk. Those who received nominations and votes in the “other” category were: TechChuff, FleetStreetBlues, Kelly Fiveash, not on the wires, Niall Nash, Chris Lake/Econsultancy, Malcolm Coles, Patrick Smith, Dan Chung, John Paton, Nick MacGowan-Lowe, Keely Stocker, Turi Munthe, Nicolas Voisin, Steve O’Hear, Paul Waugh, Christian Payne and Oben Ozaydin. This entry was posted in About us and tagged digital journalism, j-list, jlist on August 11, 2010 by Laura Oliver. Can you reveal the % or # votes for the others? If we beat Mike Butcher we’re gonna win a £10k bet we have with Mike Arrington. Of course – as you can see from the pie chart I’m afraid your share of the votes didn’t beat Mike Butcher’s. TechChuff received 61 votes – that’s 9.82 per cent of the vote according to the figures on polldaddy.com. Mike got 77 votes/12.4 per cent of those cast.